This year, Philip Gulley gave his wife the best gift ever. Last spring, I was at Edward’s Equipment in our town, perusing their selection of mowers, when I noticed a dust-covered snowblower in the corner, forlorn, like a second-string quarterback riding the bench. It was 80 degrees outside, and winter was eight months away, but time moves a bit faster the older one gets, and I realized I’d be slipping on ice and busting my head before I knew it. So I did what any responsible Christian would do and bought the snowblower, not only for my sake, but for my wife’s, who threw out her back last year shoveling our sidewalk. Doug and I loaded it in my car and I drove it home and hid it in the back corner of our garage under a tarp so my wife wouldn’t see it until her birthday later that month, when I would present it to her. Her big day arrived. I took her by the hand, led her to the garage, and pulled back the tarp with a dramatic flourish. She was, as you might imagine, stunned. Indeed, she was so overcome, she could only shake her head, too moved to speak. Now we are walking through the valley of the shadow of winter but fear no evil, for our Honda HS720 is with us. 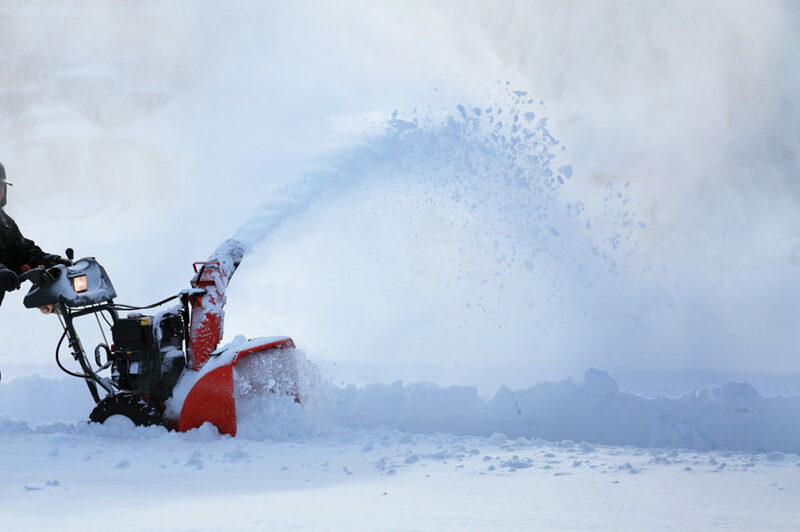 Owning gas-powered snow-removal equipment is a new development. In the past, we have relied upon shovels or the occasional charity of our neighbor, Brian Ritchie, to clean our driveway with his John Deere tractor and plow. But Brian, how shall I put this, has become rather negligent as of late, sometimes not cleaning our driveway until 7:00 in the morning, knowing full well my wife leaves for work at 6:45. When it comes to my wife’s happiness, I’ve been known to lose all sense of perspective. While I am all for community and helping your neighbor, there is something to be said for self-sufficiency. I can’t describe the pleasure of lying in bed on a winter’s morning, warm beneath the quilts, and listening as my wife fires up her snowblower with one pull of the starter rope. I roll over, raise the window shade, and watch as she pushes the blower up and down the driveway, leaving clean stripes in her wake. She is, I can tell, delighted with the blower’s efficiency. What used to take her hours with a shovel is now easily accomplished in 20 minutes; then she’s back inside with more than enough time left to fill our woodstove and fix my oatmeal. Was the snowblower cheap? It was a good deal, but it still wasn’t cheap. But when it comes to my wife’s happiness, I’ve been known to lose all sense of perspective. Should I have waited to buy it until we had paid a few of our other bills? A less thoughtful man certainly would have. But there are times in one’s life when extravagance is called for, and this seemed like such a time to me. Back when Joe Gibbs was coaching the Washington Redskins, he said, “A winning effort begins with preparation.” I’ve never forgotten that and pointed it out to Brian Ritchie when he asked why my wife did all of the work around our house. Yes, time moves a bit faster the older one gets, but with age comes the wisdom to meet our challenges and win the day! Philip Gulley is a Quaker pastor and author of 22 books, including the Harmony and Hope series featuring Sam Gardner. Hey, Wouldn’t be great as a man u would wake up early and do the showelling for ur dear wife? Reminds me of years ago when we were young and poor and I got my waffle-loving husband a waffle iron. I was being generous in using “my” blue stamps. He, however, saw it as a gift for the kitchen not for him. Interestingly enough, he never gave me another kitchen or house gift for birthdays or Christmas. Unintended consequences are sometimes quite lovely. And you are still alive to tell this tale.! Has there ever been a man as thoughtful as Philip Gulley? He sets the bar very high.